I get a lot of requests for one pot dishes. That can be a tall order to fill sometimes, because so many recipes have many different steps that most of the time require a lot of dishes, pans, and pots. Summer is here now and we all want to be outside enjoying the beautiful weather, not slaving over a hot stove/oven in a stuffy house. I found a recipe winner for you! I was cruising Pinterest one afternoon – like I do almost daily – and my attention was grabbed by the title of a garlic pasta. You all know how much I love garlic. The more the better. So if you are not a garlic lover…I’m sorry, but you will NOT like this dish at all. I have a suggestion for ya though – learn to love garlic! It’s amazing! Not only does this dish promise a creamy delicious garlic flavor, but it’s a breeze to make. I’m talking like 20 minutes start to finish cooking time. The noodles get infused with a garlicky chicken flavor from the very beginning and then it’s finished with a blast of cheese and a splash of cream and the end result is just a decadent pasta dish that tastes like something you would’ve ordered from your favorite Italian restaurant. In a pot, bring the olive oil to medium-low heat. Add the garlic, and stir for 1-2 minutes until fragrant. Mix in butter until melted. Add the salt, pepper, and chicken stock. Raise the heat and let it come to a boil. Once the stock is at a boil, drop in your pasta and cook according to the box's direction. 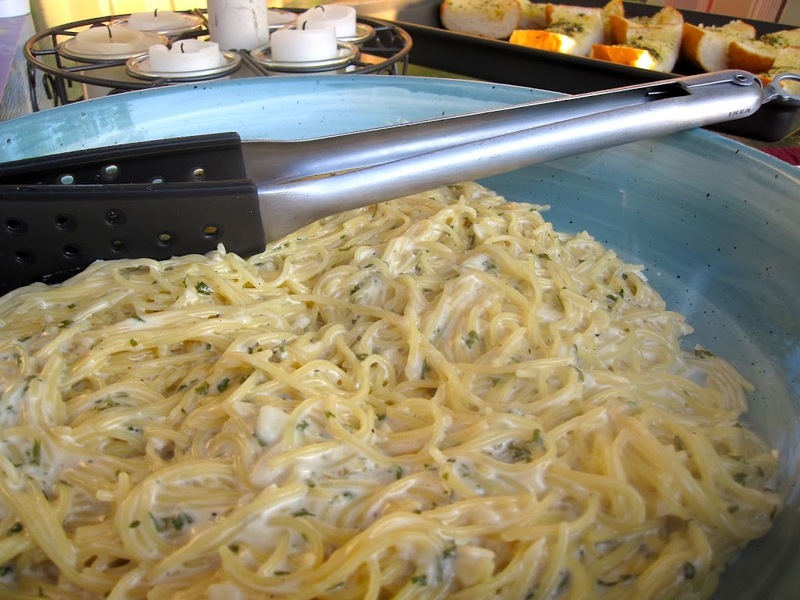 Reduce the burner heat to medium heat and mix in the parmesan cheese until it's completely melted. Turn off the heat and stir in the cream and parsley. Serve immediately. looks yummie! Do you think this would work with fresh made gnocchi too, or would they cook too short for the flavours to mix properly? You know, I'm really not sure. I've never made gnocchi so I would be curious to know that answer too. From what I do know of gnocchi they cook relatively fast right? I guess you could always make the sauce separate from the gnocchi and then combine the two at the end, just to be on the safe side. That way you wouldn't ruin your batch. 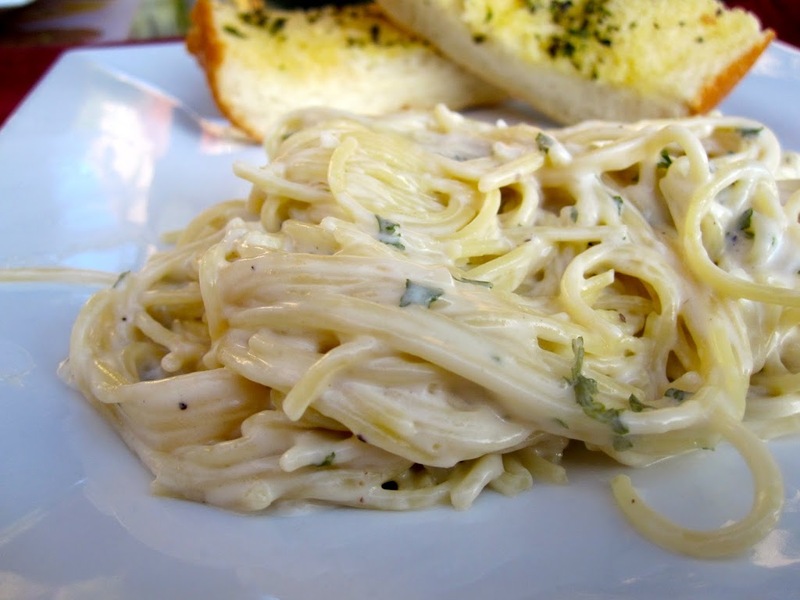 It's like an alfredo pasta Yummy!!! I am totally loving this - and as a garlic lover, I will be trying it!! It was delicious!! Next time I make it- I'm adding cherry tomatoes and spinich at the end, just because. Great recipe! Saw a recipe like this on Facebook last week. Bought all the ingredients and wanted to make it tonight. Then I couldn't find the recipe again. Couldnt find one online either. Then I tried pinterest. Found your recipe right away. Yay, I am so happy now, cause this is dinner tonight. Cant wait to try it! Thank you so much! How was it Cheryl? I'm so glad you were able to find the recipe on Pinterest. One of the great things about Pinterest. If you can't find it somewhere, Pinterest is guaranteed to have it! LOL!